Paper Size: 9.5" X 13.25"
Rainbow Paper Industries Pvt. Ltd.
Color Available: Red, Blue, Green, Yellow etc. Color: Blue, Green, Black, Red, white etc. 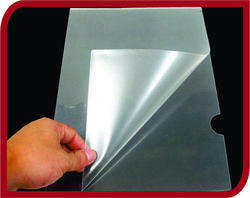 L-Shape Transparent Folders A/4 & F/S Transparent L-shaped folders helps in easy removing of papers. They are capable of holding large amount of papers and can be custom made as per the needs of the customers. Handy folder are available in A4 & FC size, & ideal for presentation and organized paper management. Available in custom required thickness from 0.14mm to 0.20mm and various colors. Considered as a renowned firm, we are readily involved in the area of presenting a wide collection of L Folder. 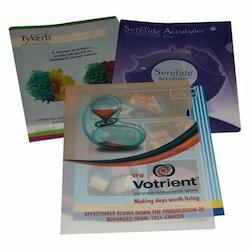 Our clients can avail superior quality Printed L Folder that are manufactured in line with industry standards. These folders are manufactured using quality raw material and help in keeping the presentations in an organized manner and safely. With detailed know-how and experience in this industry sphere, we are readily occupied in offering to our customers an impeccable Stationery L Folders.